We transform microenterprises into small businesses. 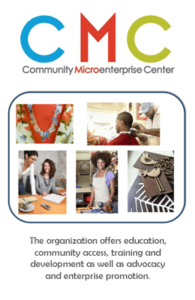 Community Microenterprise Center is an non-profit organization operating in Greater Rochester dedicated to increasing the success of very small enterprises by transforming them into small business. A vibrant, prosperous, and inclusive community. We want a world where people are valued and treated equally, enjoy their rights as full citizens, and can influence decisions affecting their lives. Create lasting economic solutions to self=sufficiency and the disruption of poverty. We are part of a global movement for change, empowering people to create a future that is secure, just, and free from poverty. To promote the economic vitality and social vibrancy that arrives from diverse local entrepreneurship. 1) Equity: CMC is determined to work toward an equitable community. 2) Inclusion: CMC strives to serve a diverse client-base through cultural sensitivity and ever-responsive relevance. 3) Self-suficiency: CMC fosters independence by promoting economic empowerment. CMC serves the women of Rochester by promoting and supporting entrepreneurship. In order to do this the organization utilizes a variety of angles. Offering workshops and training opportunities regarding new businesses entrepreneurship. Coaching one-on-one and promoting business-to-business support. Developing resource guides and tools to assist small businesses in meeting their needs. Promoting grant opportunities and offering coaching on submission guidelines. Supporting business incubation to reduce costs. Inducing social mobilization, institution building, and livelihood promotion. Enhancing solidarity, voice, and bargaining power. Combating race- and gender-based discrimination. Conducting research to improve knowledge and understanding. A micro enterprise is defined as a small business with five or fewer employees with initial capital needs of $35,000 or less. The term refers to a very small business. The majority of micro entrepreneurs are owner-operators, which has led to the use of the term self-employment. Service: restaurants/caterers, hairdressers, construction professionals, plumbers, and dog groomers. Manufacturers: carpenters, craft artisans, bakers and specialty gift makers. Essentially, micro enterprises are located on the street, in the mall, on the Internet and in homes  in cities,suburbs, towns and farms. A vibrant, prosperous, and inclusive Greater Rochester Area. To promote the economic vitality and social vibrancy that arrives from diverse local entrepreneurship. 3) Self-Sufficiency: CMC fosters independence by promoting economic empowerment. Women committed to addressing the economic disparities in the Rochester region founded CMC in 1999. Since it’s founding, many leaders both men and women have contributed to the organization. Currently, the board is led by a group of 7 individuals. The majority of board members are women, and many are women of color. The team includes individuals with critical skill sets to ensure the organization’s success including: knowledge of the financial planning, insurance, and advanced manufacturing industries. CMC also has a history of community volunteerism, which strengthens the organization’s competencies. 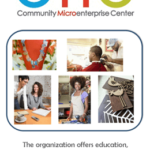 CMC will focus primarily on encouraging the full economic participation of women, low income and single parent families, youth, and under represented communities through entrepreneurship. Youth entrepreneurs and artists will also be served. CMC will focus primarily on the Rochester Metropolitan Area in 2015. 80% of entrepreneurs will be identified from the city. However, the organization will offer services in greater numbers each year of operations, and, during this expansion, will increasingly serve the Greater Rochester Area. The service region will be coterminous with the Finger Lakes Economic Development Region.